The newspaper for Fantasia. Here you may post contests, stories, polls, and other things here. Post any issues you feel need to be brought up to the users, web format, suggestions of improvements, or roleplaying plot ideas. Open this sacred book to find all the magical creatures of Fantasia. What are their skills? Age range? How about colors? 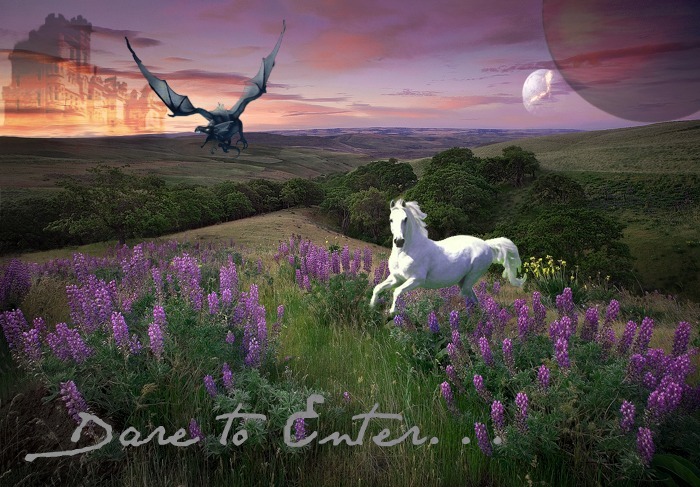 If you seek any question about the inhabitants of Fantasia come here to search. When a new traveler steps through the door, come and ponder the gypsy for the answers you seek. Look into the mirror and what do you see? Come here to post your characters and find out if they meet the requirements. All the characters that have been accepted into the story. This is only for the main roleplay! Since the beginning of time, this house has always stood on the hill. No trace of anyone living in it except for the common teenagers who toilet paper the house. And strangely, it's gone the next day. Are you brave enough to find out? Discovered when a group of kids enterd the house. The door has many gouge marks in it and spiderwebs hang around its edges. It appears only at night and rumors have it that kids have gone through it and never come out. Do you dare to find out why? The other side of the door. With thick snow covering the top of the mountain it's a true winter wonderland. But, with temperatures from 20-0 degrees F. It makes it hard to trek through the snow without the right equipment. At the bottom of the mountain a small village lays nestled in the snow. At the bottom of the mountain pass is a small village called Riuld. This town makes its living by selling equipment to travelers passing through. The houses are made of light blue colored wood, and strange animals pull little sleds through the snow. At the end of the town there is a building with a sign that says: Welk Meat. And across from that a building says: Sentari fur, perfect for the snow! A little ways beyond the Snow Mountains lies the Forsaken Valley. Mist covered mountains disappear in the heavens. On the oppositer side of the valley, large snow capped mountains rise up. In the valley, many lakes cover it's area. In the Forsaken Valley lies a large lake with pine trees covering it's right side. In winter the lake doesn't freeze but turns a light blue color but in the spring and fall it becomes a navy blue. Small white pebles cover its beaches and no fish swim in its waters. Nicor's Domain. A powerful she-demon lives here. The only animals that dare swim in her city are the Shadow Sweepers and the Mites. Shadow Sweepers are large black fish that look similiar to sharks. They disappear in the sunlight but reappear in the shadows. The Mites are golden fish that dart around with pointed noses. If one pokes you, you're dead. In the castle in Atlantis, Fantasia legends claim that Nicor keeps a store of bones from the victims that she kills. Large oak trees run along a worn path. In the forest's depths lies many creatures from Dire Mice to Oak Giants. If traveled down the worn path you will find yourself in the Valley of Shame. The Forest of Death's road leads into a wide valley. There large skeletol bones hang from it's willow trees. In here you can find Asria, a demon that is half wolf and half vampire, he is one of the strongest demons in Fantasia. Anyone who passes through his territory might end up in his stomach. East of the valley is a secret pass that enters into the Dried Lakes. No rain has fallen hear for 500 years. Nothing grows here yet it can still maintain life. The Dried Lakes resident Rock Golems and Pheonixs. To the north lay the Snow Mountains, anyone who gets trapped here look to the mountains for hope. Survival in the Lakes is near impossible. To the west of the Dried lakes lies the Refiral Desert. Large plateuas raise up and touch the blood red skies. Many battles happen here for this is why the rock is a blood red. But, beneath the sand lies Blood Trolls and Sand Elves. Nestled between two headlands, liies Golden Cove. Here, the sand is cool all day and lush green trees hang over the water's edge. At night the cove is filled with millions of fairies. Turning the sand a gold color. Above the Golden Cove lies a large castle sitted on a cloud. Though it's white, two large black dragons circle it guarding their domain. At night the shreiks and screams of fairies being tortured can be heard across the land. For, the dark wizard, No Name lives their and every night comes down and takes them. This small town is built into the beach it borders. Inside its dome is a harbor where ships can unload and dock. But, no houses are seen here for Asthena is entirely made of shops. On the outskirts of Asthena lies Erues. A tranquil city safe from the elements. Here, many wizards across the land reside in this nature friendly town. Located on the far west side of Fantasia. You can hear all the sounds of the past, present, and future if you have the Orb of Sight located in Nicor's home, Atlantis guarded by the Dragonslayer and his two animals. On the west side of Fantasia lies the Castle of Gold where King Luke and Queen Quinn rule. Located beneath the Castle of Gold. Reluctant is a safe haven for weary travelers. Sitting on a cliff, Reluctant is famous for it's sunsets and sunrises. On the East side of Fantasia lies the Castle of Blood, where the evil queen Amerterusa lives. In side here castle lies her army of evil magical creatures. Her only goal: Find the Fountain of Youth. The pier where you can fish or just hang out. Built next to a large river. The City of Happiness is the travelers hotspot. UNlike the other cities, the houses here are m de of grass and leaf and sealed together with mud from the River God's dome. The River which is called Sazuma's River, flows in the Lake of Light. Located between two hills the Graveyard is home to the evil witch Moon. On the outskirts of the Graveyard. Lies, a beautiful city that captures the future of the Earth's appearence. With large space tracks soaring above the buildings, this makes Rielk the center of trade. Roleplay cats. Big cats house cats, create your own storyline. Roleplay dog and wolves. Create your own storyline. Roleplay humans outside of Fantasia. Create your own storylines. Roleplay other things not given their own forum. All the roleplay topics that reached their end. Either they were the Firsts or the lasts. This is the archives of all the greatest roleplays ever created.